Vijaya Bank Recruitment 2018: Vijaya Bank has recently released the Vijaya Bank Recruitment Notification 2018 for the recruitment of Probationary Assistant Managers (Credit) in JMG Scale-I. This is a great opportunity for banking aspirants as Vijaya Bank is one of the most reputed public sector banks in India. It is headquartered in Bangalore and has 2125 branches all over the country. Vijaya Bank has an employee strength of more than 16,000. It offers great scope of growing both in personal and professional level and hence, is one of the best places to work for. The online registration for Vijaya Bank Recruitment 2018 has started and candidates can apply for the exam on the Vijaya bank official website. However, before applying for the exam, candidates must go through the Vijaya Bank notification thoroughly. In this article, we will provide you with all the necessary information regarding Vijaya Bank Recruitment 2018: number of vacancies, eligibility criteria, important dates, how to apply, etc. Read on to find out. Educational Qualification Candidates must have a Degree (Graduation) in any discipline with minimum 60% marks along with MBA/PGDBM/PGDM/PGBM/PGDBA – (with specialization in Finance) – through full time course from a reputed institution (two/three year programme) / Post-graduation degree in Commerce/ Science /Economics/Law OR Chartered Accountant OR ICWA OR Company Secretary. Step 1 Logon to the Vijaya Bank official website: vijayabank.com. Step 2 Go to the “Careers” tab and click on “Current Careers” from the drop down menu. Click on “View Details” on the right side of “Recruitment of Probationary Assistant Manager (Credit) in General Banking Stream – 2018”. Step 4 Click on the link provided to apply online. Step 5 Click on “Click Here For New Registration”. Step 6 Enter your basic details, like Name, Email ID, Mobile Number and register yourself. A Provisional Registration Number and Password will be generated and sent to you via your registered phone number and email ID. Note them down. Step 7 Use the Registration Number and Password to login. Step 8 Upload scanned images of your Photograph and Signature in the required format. Step 9 Enter your personal, academic, and other details. Step 10 Verify all the entered data and move to the payment tab. Step 11 Make payment of the application fees. Step 12 Submit your online application form. Step 13 Take a print out of your online application form. The application fee can be paid only in the online mode and cannot be refunded. The selection procedure will involve Online Test and / or Personal Interview. The total time duration is 120 minutes or 2 hours. 1/4th marks will be deducted for every wrong answer. Candidates will have to clear the overall and section cutoff marks as decided by the bank in order to appear for the Interview. Final selection will be based on the combined marks secured by the candidates in the Online Test and Personal Interview. In case there is a tie, candidates securing higher marks in the Online Test will be given first preference. If the tie still exists, the older candidate will be given preference. The admit card/ call letter / hall ticket for Vijaya Bank Recruitment 2018 will be issued separately for each stage of the exam. Candidates will have to login with their login credentials generated at the time of the exam, i.e. Registration Number and Password/Date of Birth in order to download the admit card. Now that you know everything about Vijaya Bank Recruitment 2018 for the post of Probationary Assistant Managers, apply for the exam if you meet all the eligibility criteria. Then start your preparation. Finish the whole syllabus and then take mock tests. As two of the three sections of the Online Test, i.e. except the Financial Management section, the two other sections are common to any bank exams, taking bank PO exams will be greatly helpful to you. Even the syllabus is same for those two sections. You can take bank PO mock tests of Embibe for free for preparing for Vijaya Bank exam. 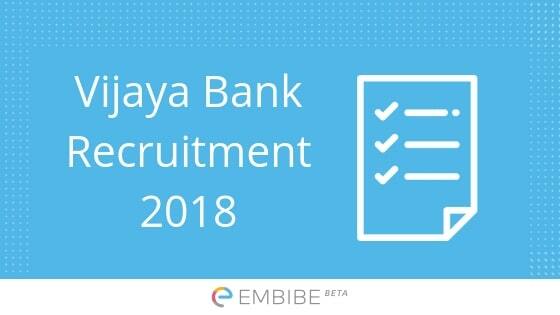 We hope this detailed article on Vijaya Bank Recruitment 2018 helps you. If you have any query, drop a comment below. We will help you out. Sir i hv Dual specialization nd had finance as minor and marketing as major in mba ..so m i eligible for vijaya bnk..
Not sure. The notification says specialization in finance. So, please contact the official authority to confirm if finance as minor will be considered. How to prepare vijaya bank probationary exam i dnt know bank exam preparation?